In “Porgs Onboard! Scavenger Hunt,” Chewbacca needs help tracking the Porgs that have been wreaking havoc throughout the ship. 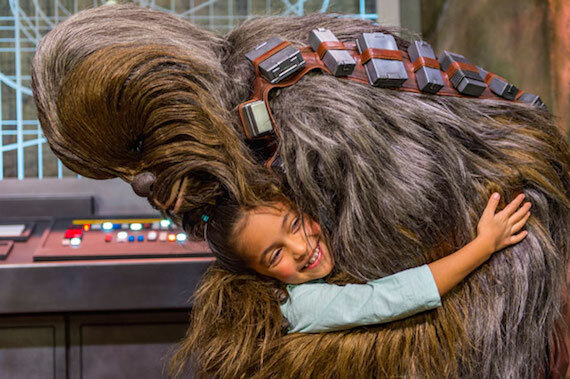 You can help find and decode secret messages to solve a ship-wide quest and be greeted by everyone’s favorite Wookiee at the end of your adventure. New in 2018, you are guaranteed a time to meet and take photographs with C-3PO and R2-D2, Chewbacca, and Darth Vader. Before you even step onboard, you have the chance to reserve these character encounters online under the My Disney Cruise section of disneycruise.com. You can step into the saga and pose with a life-size replica of Han Solo frozen in Carbonite, as well as other cool Star Wars-themed backdrops. Star Wars-themed interactive games, trivia and activities for the whole family will be hosted by Disney cruise staff on the pool deck and in the D Lounge. This entry was posted on December 15, 2017 at 10:22 am and is filed under Disney Cruise, Disney News. You can follow any responses to this entry through the RSS 2.0 feed. You can leave a response or trackback from your own site.